For a few months now, President Obama’s FDA has been showing zero appetite for standing up to the meat industry on factory-farm livestock use. In two key decisions (here and here), the agency declined to impose real restrictions on farm drug use, promoting a “voluntary” approach instead. Cephalosporins are commonly used in humans to treat pneumonia as well as to treat skin and soft tissue infections. In addition, they are used in the treatment of pelvic inflammatory disease, diabetic foot infections, and urinary tract infections. If cephalosporins are not effective in treating these diseases, doctors may have to use drugs that are not as effective or that have greater side effects. Citing concern that routine use on factory farms will push pathogens to develop resistance to these antibiotics, the FDA has banned certain uses of them. Now before I show just how limited this move is in the grand scheme, I have to stress its historical significance. For 34 years, the agency has been wringing its hands over the dangers of farm antibiotic abuse, all the while doing precisely nothing about it (save for appointing committees and issuing polite requests for “judicious” use). Now it’s actually regulating. The Pew Campaign on Human Health and Industrial Farms, which advocates a ban on routine antibiotic use, praised the move Wednesday as an “important first step” in addressing the problem. Graphic: Center for a Livable Future of the Johns Hopkins Center for a Liveable Future (h/t Helena Bottemiller) offers the chart to the right listing the amounts of various antibiotic families used on factory farms in 2009. Note that these operations used 91,113 pounds of cephalosporins—an amount that literally rounds to zero compared to the whopping total of 28.8 million pounds they burn through. By comparison, they consumed more than 10 million pounds of tetracycline, also an extremely important drug for humans. Now check out the FDA’s 2010 numbers (the latest that have been released) on livestock antibiotic use. 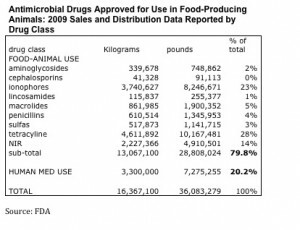 The following chart compares 2009 and 2010 FDA data. Note that the industry’s already-modest use of cephalosporin plunged 41 percent between 2009 and 2010. Meanwhile, overall antibiotic use held steady (rising 1 percent), tetracycline use jumped 21 percent, and consumption of penicillin—another important medicine you may have heard of—soared 43 percent to 1.9 million pounds. Precisely why the industry is ramping up use of these two particular drugs is something I’ll be investigating. At first glance, what I’m getting from these numbers is that the FDA has courageously restricted the use of a drug the industry barely uses and is already phasing out, and it is cravenly looking the other way as the industry increasingly leans on other antibiotics as a crutch to prop up a reckless production system. Indeed, as Wired’s excellent Maryn McKenna points out, penicillin and tetracycline are in the very antibiotic families the FDA recently decided not to regulate. We’ll know whether the agency is changing its ways if, in the coming year, it follows Wednesday’s ban with ones on drugs the industry is actually abusing. If not, then what we just heard from the FDA isn’t much more than the growl of a toothless watchdog.